The impressive Victorian house and beautifully landscaped gardens with pond, make Pontlands Park the ideal setting for you to celebrate your love and commitment. Our team of friendly, professional and experienced staff will be on hand to ensure you have a day to remember and look back on for years to come. The variety of function rooms available means we have something for everyone. Our fully air conditioned Conservatory can seat between 30 and 90 guests, during the summer months (May – September) our stunning Marquee is in situ for between 70 and 200 seated guests (dependant on day of the week) and for smaller parties one of our beautifully refurbished restaurants can be booked for up to 32 guests. Pontlands Park has two rooms licensed for Civil Ceremonies; taking the form of Civil Marriages, Renewal of Vows and Civil Partnership Ceremonies. You must book the Registrar yourself, direct with Superintendent Registrar Office on 01245 430130. 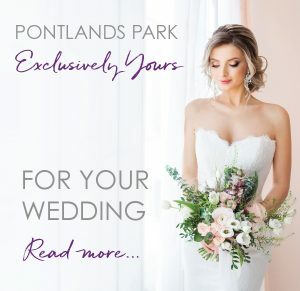 Whether you are looking for a small more intimate wedding with close friends and family or a larger traditional celebration, Pontlands Park will work with you to make sure you have the wedding that you have always dreamed of. More information can be found in our Pontlands Wedding Brochure. 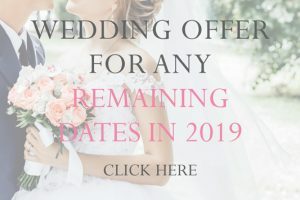 For more information about our great value wedding packages and prices please download our Dream Wedding brochure, Standard Wedding Brochure and Terms and Conditions. You can now hire Pontlands Park exclusively for your wedding, where our venue will be come ‘Exclusively Yours’ for the day. Please click here for further details on our ‘exclusive wedding packages’. Please call us on 01245 476444 or email sales@pontlandsparkhotel.co.uk to arrange an appointment with one of our experienced coordinators to discuss the plans for your special day. From when the guests arrive at the venue, to collecting me from the room, to ensuring everything run on time…I could not fault anything at Pontlands Park. I would love to have this day happen all over again…and I will definitely recommend to all my family and friends. This hotel can cater for everyone, whether it be dinner, afternoon tea or wedding venue.